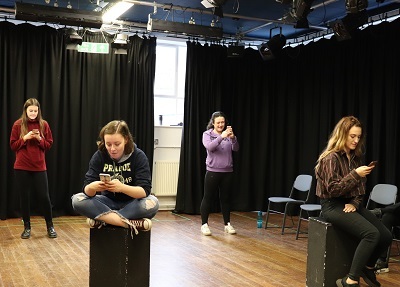 “New research at Staffordshire University is exploring how drama can be used to educate secondary school pupils about unhealthy relationships. Read the full article and check out the video on the Staffordshire University News site here. The paper demonstrates how Em and Sarah used the World Cafe approach to gain insights into NPS (New Psychoactive substances) drug usage levels with young people and the homeless population. The research is co-produce with undergraduate and alumni students and the project was the launch of the Crime and Society Research Group. The paper is based on a presentation that Sarah and Em delivered at the British Society of Criminology in June. Yesterday saw the annual Staffordshire University Postgraduate Research Conference.The conference provides the opportunity for current PhD students to present their research. The day started with refreshments, then the conference was opened by Prof. Douglas Burnham and Prof. Martin Jones, Deputy Vice-Chancellor, gave the introductory, welcome speech. Deputy Vice Chancellor, Prof. Martin Jones, Prof. Douglas Burnham and Prof. Martin Parker. The Key note speaker was Prof. Martin Parker from the University of Bristol, who focused his speech on ‘Everything you wanted to know about rejection but were afraid to ask’. He gave some advice to fellow researchers about not being afraid of rejection. After a quick break for refreshments, the first session of the presentations began from students in Business, Education, Health and Forensics subject areas. Sophie Hartless presenting her research on the ‘critical Evaluation of DNA Recovery Methods for Forensic Purposes’. Laura Wilkinson presenting her research: ‘An Investigation into the Interpretation of Hair Evidence for Casework’. Lunch was at 1pm with a Poster Presentation Exhibition, followed by the second presentation session for students in Applied Technology and Humanities. Alexia Rothwell talks through her research: ‘Multidisciplinary Intervention Strategies in Firearms Trafficking’. Esme Hookway with her poster on her research: ‘Troubled Times: An Investigation of Medieval Hospitals as Places of Refuge for Pregnant Women and Children’ (supervised by Dr Kirsty Squires and Prof. John Casella). The afternoon continued with a Panel Discussion – ‘What can you do with a PhD’? – followed by a Three Minute Thesis Competition, with presenters Danial Jovanovska, Ramy Hammady, Rohit Adhikari and Hussain al-Ezee. The day concluded at 5pm with closing remarks. Panel Discussion: What Can You Do With a PhD?